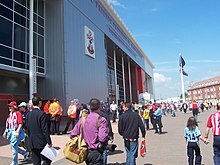 St Mary's, the home of Southampton, is one of the few club grounds to have set an attendance record in the 21st century. This is a list of record home attendances of English football clubs. It lists the highest attendance of all 92 current English Football League and Premier League clubs for a home match. It is noticeable that a large proportion of records were set at matches in the F.A Cup. The overall record is currently held by Tottenham Hotspur with an 85,512 attendance at Wembley Stadium against Bayer 04 Leverkusen in the UEFA Champions League group stage on 2 November 2016. Manchester City hold the record for highest attendance at club home ground with 84,569 at Maine Road for an FA Cup tie with Stoke City on 3 March 1934. Chelsea hold the record for highest league attendance at club home ground with 82,905 at Stamford Bridge for a First Division match against Arsenal on 12 October 1935. Attendances have noticeably declined since all-seater stadia were introduced in the late 1980s, with many records set at the terraced stadia, with their high standing capacities, that were replaced. In several cases records were achieved at a former ground rather than the club's current location. For example, Wigan Athletic's record was set at Springfield Park, not their current home, the DW Stadium. The record home attendance for five clubs occurred away from their usual home grounds. Manchester United's record home attendance was set at , the home of neighbours Manchester City, during a period when United's Old Trafford was being rebuilt following bomb damage sustained during the Second World War. During the 1998–99 season Arsenal played their UEFA Champions League home matches at Wembley, with the 73,707 attendance against Lens exceeding the record for Highbury, whilst Tottenham Hotspur also played their UEFA Champions League games at Wembley Stadium in the 2016–17 season. Similarly, Accrington Stanley's record home attendance was set when the club played an FA Cup home tie at Blackburn's Ewood Park instead of their usual home, the Crown Ground, and Stevenage's record was set when the club played a "home" FA Cup tie against Birmingham City at Birmingham's St Andrews ground. Records correct as of 23 March 2018. Italics denote attendance record set at ground not designated as usual home ground; Bold denote attendance record set at current ground. ^ Match played at Wembley due to redevelopment work at Tottenham Hotspur's home ground, White Hart Lane. ^ Match played at Manchester City's home ground, Maine Road, due to World War II bomb damage at Manchester United's ground, Old Trafford. ^ "Arsenal get Wembley go-ahead". BBC Sport. 1998-07-24. Retrieved 2007-03-27. ^ a b "Club Details". Accrington Stanley official website. Archived from the original on 29 October 2005. Retrieved 2008-03-30. ^ "Tottenham Hotspur 0 - 1 Bayer 04 Leverkusen". BBC Sport. 2017-11-02. Retrieved 2017-07-20. ^ James, Gary (2012). Manchester - the City Years: Tracing the Story of Manchester City from the 1860s to the Modern Day. James Ward. ISBN 978-0955812774. ^ "Chelsea History". 4thegame. Archived from the original on 2008-04-23. Retrieved 2007-04-08. ^ "Stadia". Everton FC official website. Retrieved 2007-04-08. ^ "1930-1939". Sunderland AFC official website. Archived from the original on 2008-03-17. Retrieved 2010-01-31. ^ "Charlton Athletic FC". BBC. Retrieved 2007-04-09. ^ "About Hillsborough". Sheffield Wednesday official website. Archived from the original on 6 March 2009. Retrieved 2010-01-31. ^ "Club Facts". Bolton Wanderers official website. Archived from the original on 6 August 2007. Retrieved 2010-01-31. ^ "Modern St James' Park in detail". Newcastle United official website. Archived from the original on 24 July 2010. Retrieved 2007-04-09. ^ "United Records". Sheffield United official website. Archived from the original on 14 January 2010. Retrieved 2010-01-31. ^ "Club History". Huddersfield Town official website. Archived from the original on 17 January 2010. Retrieved 2010-01-31. ^ "Birmingham City Records". Birmingham City official website. Archived from the original on 14 May 2007. Retrieved 2007-04-09. ^ "West Bromwich Albion". Football Supporters Federation. Archived from the original on 13 April 2009. Retrieved 2008-03-24. ^ "Around Blackburn". The FA. Archived from the original on 2007-10-29. Retrieved 2008-03-24. ^ "Attendances". Liverpool FC official website. Archived from the original on 17 January 2010. Retrieved 31 January 2010. ^ "Club Records". Wolverhampton Wanderers official website. Archived from the original on 7 March 2008. Retrieved 2008-03-24. ^ "The Post-War Recovery". Cardiff City official website. Archived from the original on 16 May 2008. Retrieved 2008-03-24. ^ "Club Records". Leeds United official website. Archived from the original on 8 August 2010. Retrieved 31 January 2010. ^ "The Away Fan's Guide: West Ham". Observer. 2007-08-12. Retrieved 2008-03-27. ^ "History of the Tigers". Hull City official website. Archived from the original on 10 February 2012. Retrieved 2008-03-24. ^ "The Turf Moor Story". Burnley FC official website. Archived from the original on 9 March 2008. Retrieved 2008-03-24. ^ "Road To The Riverside". Middlesbrough FC official website. Archived from the original on 17 March 2008. Retrieved 2008-03-24. ^ "Club Records". Crystal Palace official website. Archived from the original on 8 April 2008. Retrieved 2008-03-24. ^ "Club Records". Coventry City official website. Archived from the original on 15 April 2012. Retrieved 2008-03-24. ^ "Portsmouth Factfile". Sky Sports. Archived from the original on 21 March 2008. Retrieved 2008-03-27. ^ "Stoke City FC Records". Stoke City official website. Archived from the original on 14 May 2008. Retrieved 2008-03-24. ^ "Records and Cup Wins". Nottingham Forest official website. Archived from the original on 7 March 2008. Retrieved 2008-03-24. ^ "Vale Park". Port Vale official website. Archived from the original on 20 July 2008. Retrieved 2008-03-24. ^ "The Away Fan's Guide: Fulham". Observer. 2007-08-12. Retrieved 2008-03-29. ^ "When the Lions Roared". The Football Association. Archived from the original on 2004-10-12. Retrieved 2010-01-31. ^ "Facts". Oldham Athletic official website. Archived from the original on 11 March 2008. Retrieved 2008-03-24. ^ "Club Records". Notts County official website. Archived from the original on 25 July 2008. Retrieved 2008-03-24. ^ "Highest Attendances". Leicester City official website. Archived from the original on 10 May 2008. Retrieved 2008-03-24. ^ "Carrow Road". Norwich City official website. Archived from the original on 19 March 2008. Retrieved 2008-03-24. ^ "Potted History". Bristol City official website. Archived from the original on 9 April 2008. Retrieved 2008-03-24. ^ "North End Statistics". Preston North End official website. Archived from the original on 16 May 2008. Retrieved 2008-03-24. ^ "1960 to 1970". Derby County official website. Archived from the original on 24 March 2008. Retrieved 2008-03-24. ^ "Barnsley Factfile". Sky Sports. Archived from the original on 25 April 2008. Retrieved 2008-03-27. ^ "Gigg Lane". Bury FC official website. Archived from the original on 25 March 2008. Retrieved 2008-03-24. ^ "Brentford Factfile". Sky Sports. Archived from the original on 3 March 2008. Retrieved 2008-03-27. ^ "History". Bradford City official website. Archived from the original on 12 October 2007. Retrieved 2008-03-26. ^ "Dates and Honours". Bristol Rovers official website. Archived from the original on 13 April 2008. Retrieved 2008-03-24. ^ "Blackpool Factfile". Sky Sports. Archived from the original on 21 March 2008. Retrieved 2008-03-29. ^ "The History of Portman Road". Pride of Anglia. Retrieved 2008-01-19. ^ "Doncaster Rovers - The Facts". Doncaster Rovers official website. Archived from the original on 2012-07-29. Retrieved 2010-01-31. ^ "Brighton Factfile". Sky Sports. Archived from the original on 19 April 2008. Retrieved 2008-03-27. ^ "The Matchroom Stadium". Leyton Orient official website. Archived from the original on 7 March 2008. Retrieved 2008-03-24. ^ "Watford FC Club Records". Watford FC official website. Archived from the original on 13 April 2008. Retrieved 2008-03-24. ^ "Elm Park's Greatest Games". Reading FC official website. Archived from the original on 23 July 2008. Retrieved 2008-03-24. ^ "Swansea City Factfile". Sky Sports. Archived from the original on 8 April 2008. Retrieved 2008-03-27. ^ "Saints 4-0 Coventry City - Match Facts". Southampton FC official website. Retrieved 2012-04-28. ^ "Club Statistics". Swindon Town official website. Archived from the original on 23 March 2008. Retrieved 2008-03-26. ^ "Club Records". Southend United official website. Archived from the original on 12 April 2008. Retrieved 2008-03-26. ^ "Chesterfield Football Club – the essentials". Chesterfield FC official website. Archived from the original (DOC) on 20 March 2009. Retrieved 29 March 2008. ^ "Posh Stats & Records". Peterborough United official website. Archived from the original on 8 August 2008. Retrieved 2008-03-26. ^ "All Time Luton Records & Achievements | Soccer Base". www.soccerbase.com. Retrieved 2016-09-15. ^ "AFC Bournemouth Club Information". AFC Bournemouth official website. Archived from the original on 9 April 2008. Retrieved 2008-03-25. ^ "A record MK Dons attendance of 28,127 witnessed Karl Robinson's men take on Chelsea in the Emirates FA Cup at stadiummk on Sunday afternoon". MK Dons official website. Retrieved 2016-01-31. ^ "Brief History of Wigan Athletic". Wigan Athletic official website. Archived from the original on 6 January 2008. Retrieved 2008-03-26. ^ "A Look Around the Stadium". Carlisle United official website. Archived from the original on 17 March 2008. Retrieved 2008-03-29. ^ "Past Grounds". Walsall FC official website. Archived from the original on 13 April 2008. Retrieved 2008-03-26. ^ "Rotherham United Full History". Rotherham United official website. Archived from the original on 25 March 2008. Retrieved 2008-03-26. ^ "Official Club Records". Northampton Town official website. Archived from the original on 17 April 2008. Retrieved 2008-03-26. ^ "The Good and Not So Good Throughout United's History". Scunthorpe United official website. Archived from the original on 8 August 2008. Retrieved 2008-03-26. ^ Triggs, Roger (1984). Gillingham Football Club: A Chronology 1893–1984. Kent County Libraries. pp. 16–17. ^ "Club History". The Oxford Times. Newsquest Media Group. Archived from the original on 1 May 2008. Retrieved 2010-08-29. ^ "The History Of Torquay United". Torquay United FC official website. Archived from the original on 29 September 2009. Retrieved 2009-07-27. ^ "Exeter City". Football Ground Guide. Archived from the original on 24 July 2011. Retrieved 2008-08-26. ^ "History". Crewe Alexandra official website. Archived from the original on 23 March 2008. Retrieved 2008-03-26. ^ Ronald Atkin (2006-02-12). "Young crusaders feed the Colchester dream". Independent. Retrieved 2010-01-31. ^ "Gay Meadow". Shrewsbury Town official website. Archived from the original on 25 March 2008. Retrieved 2008-03-26. ^ "Hartlepool United Factfile". Sky Sports. Archived from the original on 20 April 2008. Retrieved 2008-03-29. ^ "FA Cup Preview". Torquay United official website. Archived from the original on 26 March 2008. Retrieved 2008-03-30. ^ "Wycombe". Football Supporters' Federation. Archived from the original on 14 October 2007. Retrieved 2008-03-30. ^ "History". Stevenage F.C. Archived from the original on 2 August 2009. Retrieved 2010-08-29. The match was played at Birmingham City's ground, but Stevenage were classed as the home team. ^ "The Abbey Stadium". footballgroundmap.com. Retrieved 2015-06-25. ^ "The Reckless Guide to Wycombe". Barnet FC official website. Archived from the original on 5 March 2008. Retrieved 2008-04-17. ^ "Cheltenham Town". Football Ground Guide. Archived from the original on 24 July 2011. Retrieved 2008-08-26. ^ "Timeline". Morecambe FC official website. Archived from the original on 2008-06-18. Retrieved 2010-01-31. ^ "Aldershot Town". Football Ground Guide. Archived from the original on 19 May 2011. Retrieved 2010-01-31. ^ "Oxford United - We've Met Before". Burton Albion FC. 6 August 2010. Archived from the original on 19 March 2012. Retrieved 23 January 2011. ^ "Honours & Records". Fleetwood Town official website. Archived from the original on 31 December 2012. Retrieved 2012-12-02. ^ "Crawley 1–3 Reading". BBC. Retrieved 2012-12-02. ^ "Wimbledon 1–2 Liverpool". BBC. Retrieved 2015-01-05. This page was last edited on 17 April 2019, at 19:33 (UTC).